The Magic Carpet on the Celebrity Edge slides up and down the side of the ship. Every year a new flotilla of cruise ships sets sail to decorate the world’s waterways, glowing at night like floating lanterns. But that’s just a hint of the magic at play, because the brightest treats lie within, where you’ll literally find whatever floats your boat. 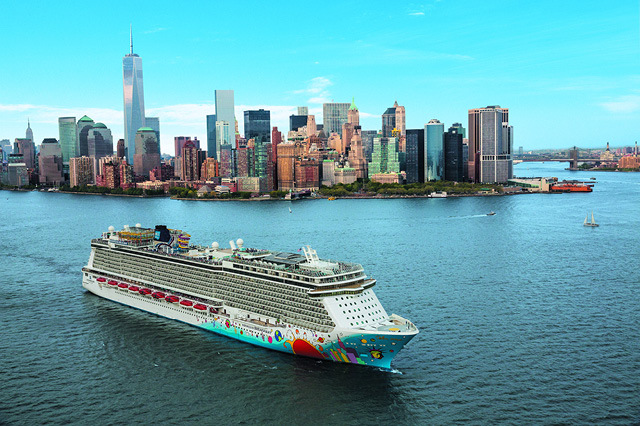 Here’s what’s new this year in the cruising world. Symphony of the Seas has surpassed its Oasis-class sisters to snag the title of world’s largest cruise ship. New attractions, including a laser tag arena, adorn Symphony’s seven “neighborhoods” along with many now-iconic features. Picture everything from a zip line strung atop the ship to an ice rink tucked deep inside its belly. 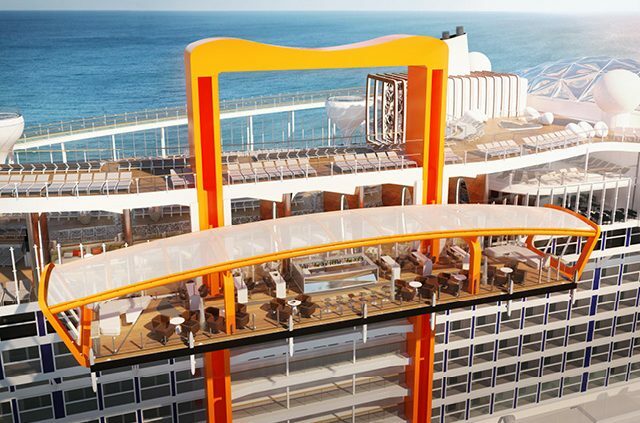 Passengers can tackle the tallest slide at sea, hang 10 on surfing simulators or hop aboard a hand-carved carousel. The Boardwalk neighborhood, which already boasts an AquaTheater starring acrobatic high-divers, adds a sports bar and arcade. For a fresh bite, a New England-style seafood shack with a raw bar beckons. And, for families, the coolest suite at sea makes its debut, complete with a Lego wall and a slide that runs from a bedroom to the living room. The tech-savvy boat is also packed with robotic bartenders, virtual balconies and facial-recognition technology that eases embarkation. The ship will sail to Europe in the spring and the Caribbean in the fall. 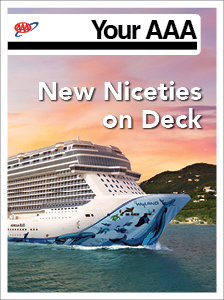 It’s been nearly a decade since Celebrity introduced a new class of ships, but its Edge vessel makes that wait worthwhile. A Magic Carpet (basically a tennis-court-sized platform suspended over the ocean) slinks up and down the ship’s side, serving different purposes – think spectacular alfresco dining and easy-access tendering – depending on its location. Stateroom wizardry is epitomized in its infinite verandas, where the touch of a button erases the boundary between indoor and outdoor spaces. The Edge also promises a whimsical rooftop garden, martini-glass shaped whirlpools and a three-deck haunt dubbed Eden that incorporates more windows than any other room at sea. Eden mixologists will craft cocktails with herbs picked from a living library of plants that doubles as an architectural detail. The boat will sail to the Caribbean in December and to European destinations throughout 2019. 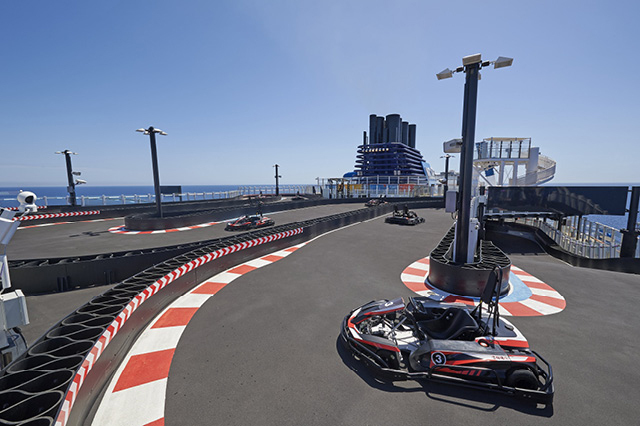 Guests on the Norwegian Bliss can compete in go-kart races. Norwegian Bliss revs up the fun with a go-kart race track designed to accommodate drivers of all skill levels, while thrill-seekers can brave a translucent free-fall slide that loops out over the ocean. For refined entertainment, a full-stage production of the Tony-winning musical “Jersey Boys” is on tap. Live country music and savory fare rule at Texas Smokehouse Q, where meats are smoked over hickory, oak and pecan woods. And, for a sweet treat, a dedicated dessert restaurant with a chocolate emporium vibe awaits. Built to spend summers sailing in Alaska, Bliss sports an expansive observation lounge as well as signature hull artwork by Wyland, one of the world’s premier marine life artists. The ship will also visit the Caribbean, the Mexican Riviera, and Central and South America. Riverboats are also making a big splash this year with the launch of a new line, U by Uniworld, aimed at 21- to 45-year-olds seeking an active, affordable option to explore Europe’s waterways. 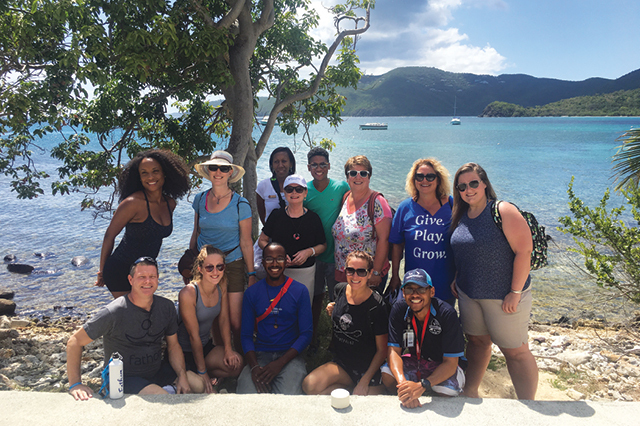 The product melds Uniworld’s cruising expertise with sister-brand Contiki’s youth touring know-how. The two boats, The A and The B, have been renovated with striking, matte-black exteriors, communal dining spaces and some triple-occupancy cabins. Guests will also find silent disco parties, top-deck campouts and fitness classes. What are you most looking forward to about a cruise in 2018? Tell us in the comments section below. 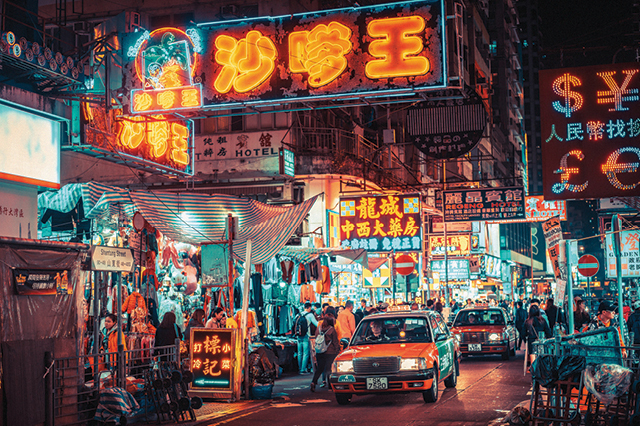 Read more Your AAA content about ocean cruises and river cruises, then click here for incredible offers on hundreds of voyages.